Bankruptcy Information | Bankruptcy, Easter and Passover. Home > Bankruptcy Basics > Bankruptcy, Easter and Passover. 07 Apr Bankruptcy, Easter and Passover. What does bankruptcy, Easter and Passover have in common? Let’s see if you will agree with my analysis. What are the words that pop into mind when you think of bankruptcy? Guilt, sin, slave to debt, fresh start, family, broke, worthless, forgiven and hope. What words come to mind when you think of Easter? Eggs, family, Cadbury, Lent, resurrection, hope, forgiveness, fresh start, do over, and a chance to begin a new. What words come to mind when you think of Passover? Slavery, family, Seder, forgiveness, hope, freedom, and remembering the past.There is a theme that runs through bankruptcy, Easter and Passover, regardless if it is intentional or not. One of the reasons that people file bankruptcy is to free them from being a slave to their debt. The very definition of being is a slave is that one is completely within in the power and will of a dominating source. Whether it is student loan debt, a mortgage or overwhelming credit card debt many people feel powerless when dealing with these creditors. In other words they feel like they are slaves to the credit and lending industry. When it comes to Easter, slavery can be seen in connection with sin. Much like the debtor who feels powerless against the creditor, individuals often times feel powerless with respect to their sins. Have you ever felt powerless against food, bad thoughts or behaviors? You would not be human if did not at one time or another feel powerless but for some it is a way of life and not a momentary lapse of judgment. They are truly slaves to their demons of bad habits. What about Passover? The story of Passover is based on the Exodus of the Israelites from slavery. This was an incredible feat as the Israelites were enslaved in Egypt for 410 years before Moses asked the Pharaoh to release them from the bonds of slavery. At first the Pharaoh agreed but at the last moment decided he would not honor this agreement. This is when Moses led his people to freedom. Passover is time to reflect upon the time when the Israelites were enslaved by Pharaoh and how modern days Jews seek a renewal of life and a reaffirmation of freedom. The are two ends of the spectrum that you can view when looking at just about everything in life. Your glass can either be half empty or half full. Slavery is a very dark and heavy theme that runs through bankruptcy, Easter and Passover. Definitely at the half empty end of the spectrum. But let’s look at the opposite end where it is light due to hope, forgiveness and resurrection. Filing for bankruptcy is about breaking the bonds of debt slavery and forgiving your debt (in most cases). In fact, as bankruptcy attorneys we counsel people to forgive themselves because they are riddled with guilt for the amount of debt they may have incurred or how they feel like a failure for not providing for their family. God in Deuteronomy 15: 1 & 2 speaks of forgiveness with relation to debt, but guilt continues to hold many as slaves to their past. My response is that in order to seek a fresh start and begin a new you must forgive yourself as God has forgiven you. Once someone files for bankruptcy it is not uncommon that debtors feel a renewed spirit and hope that they can get their lives back on track once the burden of debt has been forgiven through the bankruptcy discharge. Bankruptcy is not an easy fix for your financial troubles. In fact bankruptcy will only be a short term solution if you are not willing to do the tough work of analyzing why you are in debt and how you are going to change your habits to prevent this from happening again. Easter is time to reflect upon our past and why Jesus died on the cross, ask for forgiveness and break the chains of sin through repentance so that me may begin a new. Hope springs eternal during the Easter season. 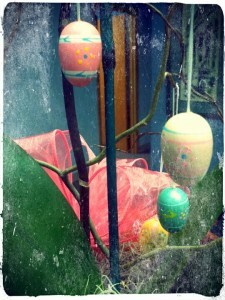 For many, Easter marks the point in time when our surroundings appear to be re-born. The grass begins to grow, the birds return to sing their songs and we believe that finally this may be a new beginning for us. Easter and the resurrection do not offer a miracle cure for the demons that haunt us. It is only through hard work, commitment and forgiveness that we may begin our journey to a new way of life of viewing our glass as half full. Passover is similar as it is time to remember the past while moving forward with hope of redemption. I have been honored to attend several Seders in my lifetime and what I remember most about the celebration, is just that. Instead of focusing on the slavery and the treatment of one’s forefathers it is time focus and celebrate how hope gave power to the Israelites to face their greatest fears and seek freedom. Passover celebrates the fact that hope lies within everyone’s reach. The beacon of hope stems from forgiveness, recognizing our past mistakes and having the courage to begin a new journey. As you celebrate this weekend or take time to reflect I pray that the burden of debt has not enslaved you to the point of losing all hope. Hope is the ability to expect something with confidence and knowledge can give you the power to achieve what you are hoping for. So never give up hope and never stop seeking the knowledge that gives you the power to change your destiny.